Historic landmarks from the past have stories and tales - some are even haunted! 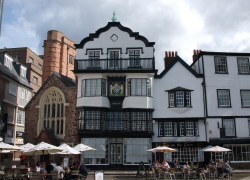 Discover Exeter's places to see, the city has lots of historic buildings and period architecture hidden in delightful little streets just waiting to be explored. Whether you're a resident or tourist, if you're on a lunch-hour or a day out, there's plenty of places to visit. Why not find the world's narrowest street, the oldest hotel in England, or where Dickens got his Fat Boy! In the High Street almost opposite the National Westminster Bank you will find the Guildhall and the Turks Head Public House. The Guildhall, although altered over the years with a rebuild in the 15th century, then further pillars and Tudor frontage added in the 16th century, dates back to 1330 and is the oldest municipal building in the country. The Turks Head was a 15th century Inn located next door to the Guildhall and is said to be the Inn where Dickens found the original for his "Fat Boy" character in the Pickwick Papers (1837). Sadly, The Turks Head which was one of Exeter's oldest surviving public houses closed in 2005. The former Inn now serves beverages and Italian cuisine to a more modern clientele in revamped surroundings. A little further along the High Street opposite the old Exeter Bank building is Parliament Street. This street is approximately 1220mm at its widest making it the world's narrowest street. Walking to the end of Parliament Street will bring you into Waterbeer Street on the edge of the Guildhall Shopping Centre, this runs parallel to High Street. Turn right, and in the middle of the courtyard on the left is the medieval church of St Pancras. First recorded in 1191, and dedicated to the fourteen year-old martyred saint (304). The Royal Clarence Hotel is located in Cathedral Close, right in the heart of the city centre. It was built by W M Praed in 1769 and reported to be the first Inn in England to be called a 'Hotel'. The adjoining historic building on the corner of Cathedral Yard and Martins Lane that's now part of the hotel once housed Exeter's first bank. This was also established by William Praed and is now home to the hotel's Michael Caines Café Bar & Grill. 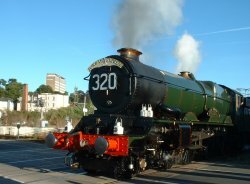 The Royal Clarence today still offers accommodation for travellers and visitors to Exeter in what is possibly the city's best positioned hotel with some rooms that have picturesque and inspirational views of the magnificent Exeter Cathedral. The Redcoat Guides offer various walking tours of the city. 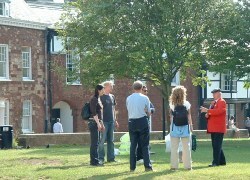 For more details on these Exeter walks - Visit the Things to Do page!